Standard price for occupancy by 2 persons - BB 16 - "Adults only!" 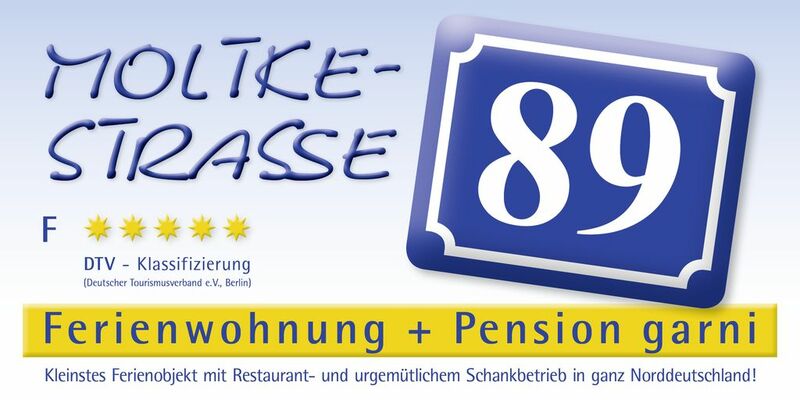 At the "Gateway to Hildesheim's East Town" awaits you in the MOLKTESTRASSE 89 in an ideal, central location, a small and fine family business, in which the loving care and attention of the guest is the focus! Right next to the "Steingrube", a large, green, inner-city park, you will live in a Gründerzeit building from 1884, which is perfectly equipped down to the smallest detail and completely modernized in the decades-long tradition of craftsmanship and harmoniously staged throughout. Sabine and Bert-Holger Fütterer do not run a hotel, there is neither a night porter nor a sauna or bathing area. But wellness in the "actual" sense is very important. Enjoy in peace and serenity all services and offers of the only holiday object in the entire region, which is rated by the DTV Berlin (German Tourism Association) with five stars. As a guest guest let it just "go well" and indulge you unrestrainedly the delicacies from kitchen and cellar! The entire property comprises four bedrooms and is set up and furnished for the living and living of individual travelers to groups of a maximum of eight people. The comfort apartment is located on the ground floor (raised ground floor) and is intended for the occupancy of two to four people with a comprehensive full equipment. In the house there are two daylight baths and two complementary WCs. Guests who do not want to take advantage of the diverse, gastronomic concept of the house, can provide themselves in the large kitchen on the ground floor (14.5 sqm) first-class and easy self-catering. There is nothing missing to happiness! Our bike-friendly operation keeps two bicycles with a shopping basket always ready. Unfortunately, the house is due to its structural design from the 19th Century not barrier-free and therefore not suitable for wheelchairs! There is no elevator! All traffic routes are very short and extremely convenient. We ask our guests to refrain from accompanying four-legged companions as we can not provide suitable shelter for your "little darling". And in consistent implementation of the mission statement of our holiday resort, which since the first second of its existence is a member of DEHOGA-Niedersachsen, all amenities ONLY ADULT are available (BB 16 - "ADULTS ONLY!). We introduce a "boarding house" at a distance of 870m to the historic market place. As this customary term in southern Lower Saxony seems little used, we use as German translation of the term "Apartment + Pension garni". The little word "garni" covers the whole range of services that we offer to the inclined guest in addition to pure overnight stays. Of course, a good day in the morning with a GOURMET BREAKFAST in the "little restaurant" begin and only at night in cheerful circle in our own, typical North German tavern in the basement or our wine bar in the historic vaulted cellar end. On request, we are always there for you! Please contact us in time. "Outside in the yard" vegetables, fruits, berries and herbs grow in a green oasis, even in our own greenhouse, for direct use in our "fine" kitchen.